Acknowledgment: This work has been summarized using the Workman Publishing 2003 edition . Quotations are for the most part taken from that work, as are paraphrases of its commentary. Information from various other web sources is also interspersed, as noted. Overall Impression: This is a very entertaining, well-written, and profusely illustrated book, the author being an old hand at Mars exploration and apparently a man of many talents including painting and writing a Martian novel. This Guide was written just before the landings of the latest Mars rovers, Spirit and Opportunity. Russian planetary scientist Mikhail Marov and the author summarize past and current missions to Mars. [The following uses supplemental information from the NASA and JPL's websites]: these include successful flybys in the 1960s by the US's Mariner 4, 6, 7, and the first orbiter of Mars by Mariner 9; the successful landings by Viking 1 and Viking 2 (in 1976); the only partly successful Russian mission to Mars and Phobos in 1988; the failure of the US's Mars Observer in 1992-3; the failure of the Russian Mars mission in 1996 and the US's Mars Climate Orbiter (in 1999); the newly adopted NASA "faster-cheaper-better" approach; the eventual success of NASA's Pathfinder lander (which deployed the rover Sojourner in 1997); the orbiter Mars Global Surveyor (arrived 1997) and orbiter Mars Odyssey (arrived 2001); Mars Express polar orbiter (arrived 2003); and the Mars Exploration Rover Missions (Spirit and Opportunity, arriving January 2004). Marov summarizes future missions planned and addresses the question, why Mars? He responds (1) we want to know how Mars evolved and why it became so different from Earth, (1) we want to know whether there is life on Mars, and (3) Mars is the most accessible and challenging goal for future human space flights. Mars at the time of the book's writing was nearing a distance of only 34 million miles from Earth, the closest it has ben in nearly 60,000 years. Compared to Earth, Mars has half the diameter, one tenth the mass, 71% of the density, 38% of the gravity, and 43% of the solar irradiance. The Martian day (or sol) is about 24.6 hours and Mars is tilted in its orbit like the Earth, giving it seasonal patterns of winter and summer. The Martian year is 669 sols (687 Earth days). There is no surface liquid water, due to low atmospheric pressure and to rapid evaporation or sublimation. The typical daily air temperature ranges from -87 degrees Celsius to -25 degrees Celsius, with sun-exposed rocks reaching up to a high of about 10 degrees Celsius. The atmospheric pressure is about 1% of Earth's, the air is almost pure carbon dioxide, and dust storms are a special hazard for the future traveler. Mars has almost no magnetic field. The modern era of Mars exploration began with the Mariner space probes of the 1960s. Mariner 4 revealed a cratered landscape like the moon and suggested that Mars was a dead planet. Mariner 9, the first to orbit around Mars, revealed a much more varied terrain (once it could see through a planetary-wide dust storm raging on its arrival), including tall mountains and dry riverbeds called channels (which had no relations to Lowell's fanciful straight canals). A new and more meaningful nomenclature for planetary features was devised in the 1960s and 1970s and adopted by the International Astronomical Union in 1973, one which employed Latin words including planitia (low plain), mons (mountain), vallis (valley, usually a dry river channel), patera (shallow crater, usually a caldera), fossa (long narrow valley), vastitas (vast wide lowland), planum (plateau or high plain), rupes (scarp or cliff), and rima (narrow fissure)--this nomenclature has largely but not completely supplanted Schiaparelli's more poetic names. Mars Global Surveyor (MGS) has obtained more than 100,000 detailed images of the Martian surface, and surface topographic mapping has also been aided greatly by the Mars Orbiter Laser Altimeter (MOLA) using the elapsed time of emitted light's reflection back to the instrument as its yardstick--its accuracy was to within a few feet. (1) Noachian Era--Incorporating the Schiaparelli-selected word alluding to Noah's flood, the name of this era derives from the ancient uplands of Noachis in the southern hemisphere, extending from 4.5 to 3.5 billion years ago, a time of active erosion, intense volcanism, probably a denser atmosphere, and possibly the presence of lakes and oceans. (2) Hesperian era--the word originally meant "in the west" [denoting the frontier] or "deriving from the Evening Star [Venus]"; the era is named after the plains of Hesperis also in the southern hemisphere, extending from c. 3.5 to c. 2-2.5 billion years ago, a time of transition to dryer and dustier conditions, with water going underground and flowing in many surface channels for the last time. (3) Amazonian Era--named for the young lava-covered plains called Amazonia Planitia, beginning c. 2 billion years ago to the present, a time of lower geologic activity such as volcanism, lower rates of cratering, and only occasional releases of underground water. The determination of the age of Martian rocks was supplemented in the 1980s when meteorites were found that were thought to have been ejected from Mars (this was based on the similarity of contained gases to the Martian atmosphere). Unlike the 4.5 billion age of most asteroids, these rocks were mostly only a few hundred million years old. I must confess that this type of inferential evidence seems fairly suspect to me. This chapter addresses the interesting question as to why the Martian landscape, specifically the dark markings, appeared to undergo visible changes. The region of Mare Tyrrhena, now Terra Tyrrhena, exemplifies these constantly changing patterns, which are the result of wind-blown dust and grains, producing wind tails, streaks, dust deposits leeward from crater rims, deposits of dark grains changing to deposits of light colored grains, etc. The author presents similar appearances as seen on Earth. (In fact, throughout the book, he makes the case for explanations of Martian findings where possible by showing similar appearing phenomena on Earth). The author recounts in a sidebar how he got into the space exploration business during a golden age of science and NASA funding. This chapter explores the evolution of thinking about canals. There was some basis for such conclusions, in that there are vaguely linear features and crude dark streaks that could be interpreted as canals, given the low resolution instruments of the day and the powers of the mind and imagination to extend and fill in missing information. If wind is constantly obscuring or changing many surface features on Mars, why are there some constant large features, persistent patterns of light and dark soil? Syrtis Major (named after the Gulf of Sirte in Libya) is one of the most prominent dark features on the planet (see image at top of this page). Modern astronomers have shown that these dark areas are nearly neutral gray in color, but appear bluish or greenish as an optical illusion when juxtaposed against other orange/red features, and closer observations have shown that the darker color derives from relatively unweathered grayish rocks and gravels comprised largely of basaltic lava flows. The lighter colored redder soils are finer more weathered grained soils containing rusted iron-bearing minerals. Laser altimetry from MGS has shown that Syrtis Major has the contour of an enormous shield volcano rising about 2 kilometers, so that when soil is weathered away, it blows off this mountain. The brighter areas of Mars, so called deserts, are the "sinks" where wind-blown dust collects. However, not all Martian volcanoes are dark. Further investigation and speculation suggests that there are two types of basalts, the dark Syrtis Major type of classic basaltic composition versus a more glassy and andesitic basalt found in the northern latitudes (perhaps resulting from eruption through water or ice). The author begins the first of several chapters dealing with predominantly Noachian regions. The Hellas Planitia is the remnant of a large (1700 km in diameter) impact crater, lying south of Syrtis Major, having its floor 8.2 km below the surrounding uplands and thereby being the lowest point on the planet. Its ancient rim has largely disappeared presumably by water erosion. The floor, which is sometimes covered in frost due to its high latitude, exhibits a complex pattern including river channels. Mars currently has almost no magnetic field, indicating it does not have an actively churning molten iron core like the Earth's. But MGS found that the upper highlands of the most ancient Noachian rocks surrounding Hellas were magnetized, whereas the rocks of the Hellas basin were not, suggesting that the Martian magnetic field existed when the former were formed (probably before 3.9 billion years ago), but had waned by the time of the solidification of the impact basin (estimated at around 3.7 billion years ago). The author presents a postulated timeline for Mars, beginning at 4.55 billion years ago. He also presents speculation that the loss of the protective effect of the magnetic field may have left the Martian atmosphere exposed to charged solar particles which helped to carry it off and effect the transition to the dryer planet we know today. The highest crater densities are found in Arabia Terra (NW of Syrtis Major), therefore some of the oldest surface features on Mars. There has been little volcanic activity or water erosion to disfigure these features. The amount of cratering in the various regions of Mars bears no correlation with latitude. The number of craters visible on Mars is much greater than Earth's due to greater geologic activity on Earth-- volcanism, water erosion, orogeny, etc. The moon's highly cratered surface is old and inactive, the Earth's is young and active, and Mars is in between. Noachian terrain often reveals highly eroded crater rims (from water or wind erosion), nearly buried craters, and various strata exposed by wind erosion. Hesperian craters are less eroded than Noachian, implying a change in erosive conditions and not just age. Craters are formed by impacts of asteroids etc. moving at 12-20 km/sec, creating an underground shock wave and a bomb-like release of energy that leads to a symmetric circular crater regardless of the angle of impact. The final cavity is 1/3 as deep as it is wide. The upward upheaval of strata by propagating energy from the collision creates a raised rim (like Arizona's Meteor Crater). A rebound central peak may form on the crater floor. There are often a blanket of ejecta and small secondary impact craters surrounding the crater. A thick slurry-like ejecta blanket accompanied by rampart-like masses around the crater argues for underground ice, and radial grooves in the ejecta blanket can be attributable to steam-enhanced velocities of some of the ejected material. Ramparts suggesting the presence of underground water (ice) is usually seen in larger craters, but as one moves to higher latitudes, ramparts can be seen in smaller and smaller craters, suggesting that water as ground ice is closer to the surface. At the poles, water ice is permanently at the surface and visible, but at lower latitudes, the rampart craters give an indirect means of estimating the distance to the top of the underground layer of ice. Estimates are 200-450 meters at the equator, 50-200 meters at 30-55 degrees latitude, and less than 100 meters poleward of 55 degrees. The author elaborates on the method of dating surfaces using crater densities, which he developed using moon rocks of independently established age as calibration points. The greatest concentration of Noachian terrain is in the southern hemisphere in the area of Noachis Terra. The craters in the Noachian era often appear softened, thought to be due to a greater degree of water in the soils, making them more easily deformable, and to a greater degree of water erosion (not just to expected greater erosion from their older ages). Current estimates are that the Noachian atmosphere was 15-70 times as dense, reaching 10-50% of the Earth's atmospheric pressure, and much of which might have been water vapor. There were many local lakes and seas, some deeper than 30 meters--in short, ample liquid, ice, and water vapor was present. Based on evidence from differential isotopic compositions, it is estimated that Mars has lost 33-90 percent of its original atmosphere into space. Was there an ancient greenhouse effect with greater temperatures on Mars in the past than now, perhaps from the carbon dioxide? The question has not been settled. 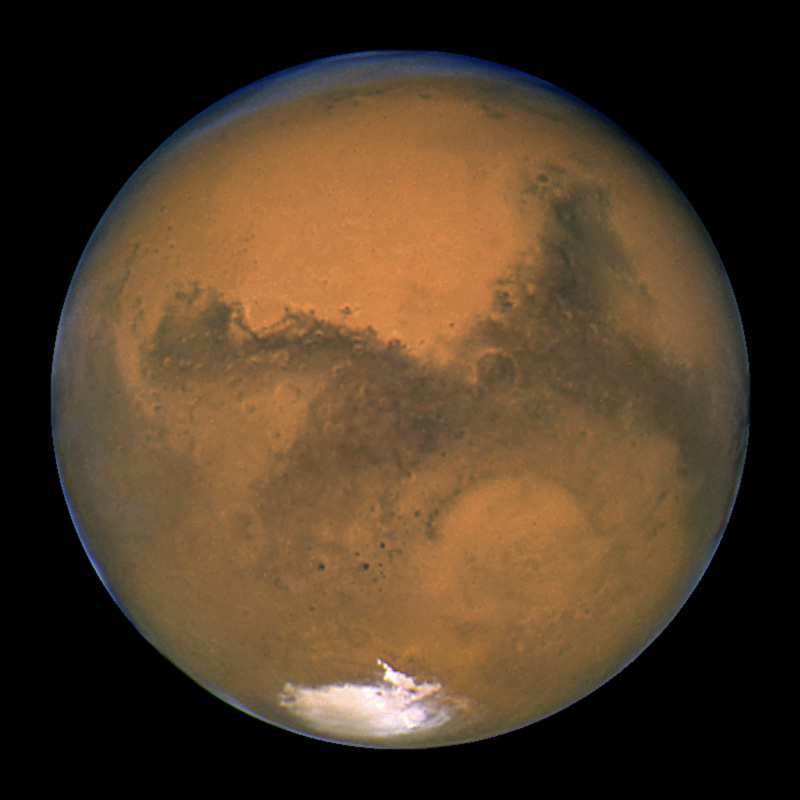 Ice at the surface of Mars will sublimate rapidly except at the extremely low temperatures at the poles. But it can exist underground protected by a layer of soil. The greater the ice concentration and the closer to the surface (as one might predict in going to higher latitudes), the more likely craters are to exhibit ramparts and terrain softening. This correlation has been demonstrated with the Mars Odyssey orbiter, which can detect water ice in the upper few meters of soil. It found that in soils located above 60 degrees latitude and below the top 1/2 meter in depth, water ice comprised 20-50% of the soil mass--such soil would be prone to glacier-like movement and thus could contribute to terrain "softening" (and in the extreme, to "melted craters"). There is even some evidence for short-lived Martian glaciers. How deep is this ice?--this question, important for future human missions, is also not yet answered. The widespread pulverization of Noachian soils by impacts might have left a deep layer of gravel that could readily absorb much of the water present. The northern inner slopes of the rim of Bakhuysen crater exhibit dendritic valley networks suggesting water inflowing to the crater floor, possibly indicating a time of Martian rainfall, or alternatively melting surface ice or snow, or melting underground ice. Chapter 10: A Great Waterway? The author presents Stephen Clifford's hypothesis of a great water cycle in which water falling as precipitation in the higher southern hemisphere tended to run "downhill" (as surface water or in aquifers) to the lower elevations of the northern hemisphere, and in doing so created many now-dry south-to-north oriented water channels during the wet Noachian era. The Argyre Planitia is a large impact basin that may have filled with this water flow, and water exited its north rim to continue the northward flow in a shallow channel inferred from altimeter data. At 8,000 km in length, this may have been one of the longest fluvial systems known on any planet. Was there ever a Martian ocean? The most likely candidate is Vastitas Borealis, a plains region in the far north ringing the pole with an elevation of -4 meters relative to the mean reference level as determined by MGS altimetry. Some of this area, in addition to rampart craters etc. exhibits patterned ground, as is seen in the Canadian tundra and reflecting freeze-thaw cycles of underground ice. There is evidence according to Tim Parker and MGS imaging somewhat suggestive of fossil shorelines. If Vastitas Borealis was once an ocean, it would have had an average depth of 570 meters, reaching 3 km at Utopia Planitia. However, the present surface features are thought to be Hesperian, not Noachian, and the postulated ocean floor is now well buried in younger lava. But we can still ask, did life form in these Martian seas?--it would be a good location to go looking for fossils. The author discusses the infrared detecting thermal emission spectrometer (TES) on board MGS, which might have been able to detect carbonates and salts expected to be left behind by seas and oceans, but unfortunately there was an obscuring cover of dust over much of the rock examined. However the TES did detect hematite in Terra Meridiani, and hematite is a mineral often associated with hot springs. The area in which it was detected may be a deposit in an old lakebed that has been uncovered ("exhumed") relatively recently. The author digresses to discuss asteroid impacts on Earth. Some craters such as this one named are filled in heavily with layered sediments deposited by air or water. The White Rock area of crater Pollack proved to be merely lighter rock contrasted against darker rock, though the rock had a highly striated heavily eroded surface. [For a good chronology of all Mars missions, see here.] These chapters recount the failed Soviet attempts at flybys of Mars in the 1960s, and the failed attempts to place landers on Mars in 1971. (Mars 2 and 3 had to contend with severe dust storms seen also by Mariner 9--Mars 2 crashed in the Hellespontus mountains area at the Hellas rim, while Mars 3 landed in the cratered uplands of Terra Sirenum but failed after 20 seconds of operation). The huge dust storms are also associated with dust devils, which leave long tracks across the landscape. This chapter recounts the successful Viking 1 and 2 orbiters and landers, the landing on July 20, 1976 of Viking 1 being on the rock-littered plain of Chryse Planitia located at 22 degrees north latitude. The Americans had won the race to place a working lander on Mars. Chryse presented a Hesperian terrain with many flood channels. These landers imaged the surface of gravel, dust, duricrust (cemented soil), rocks and dunes, and performed soil analyses showing a basaltic composition but unusually rich in chlorine and sulfur. However, there was no evidence found of organic molecules or of life in the soil. The absence of ozone leaves the soil exposed to solar ultraviolet, leading to highly reactive peroxides, making life at the surface unlikely, but life could still exist underground and in rock fissures, as has been found in Antarctica. This chapter begins a section dealing with the Hesperian landforms. The prototype is Hesperia Planum. Hesperian features are more recent, better preserved, less heavily cratered, and more diverse than Noachian. Hesperia Planum contains two old prominent volcanoes, Hadriaca Patera and Tyrrhena Patera (whereas volcanoes are not prominent among the Noachian sites due to erosion and cratering, etc.) Erosive channels and gullies on the sides of these volcanoes suggest rainfall, but might have been produced by condensation of erupting steam, very fluid lava, or flows from melted ice. This is the site where Viking 2 landed on September 3, 1976, after a considerable debate as to what would be the best landing site following the successful Viking 1 landing. Like Chryse, this was a Hesperian terrain littered with basaltic rocks, but it was more to the north at 48 degrees latitude. There was more duricrust than at Viking's 1's site. The abundant rocks littering the ground are left behind by the frequent 10-meter scale cratering and winds that have blown away much of the finer material. Viking 2 biology experiments showed no chemical reactions suggestive of life. The sky was seen to have pale, apricot-peach color. The author comments on the short attention span of the news media, often neglecting more significant and better images that come out after a mission has been in progress for some time. This chapter discusses Earth's plate tectonics and continental drift, which are not seen on the moon or on Mars, except possibly for the Thaumasia mountain range near the Tharsis volcanic province, where there may be evidence for local tectonic stresses. Hesperian Mars is laced with dry riverbeds from ancient floods, exemplified by Ares Vallis. This is a large outflow channel or riverbed, cutting through Noachian and Hesperian plains. Could some other liquid than water have flowed in these channels?--Unlikely. Some of these channels were probably formed during catastrophic, sporadic flooding, similar to that which occurred in Idaho and Washington. The water may have originated from underground ice. Water that was briny could stay liquid at temperatures as low as -40 degrees Celsius. Water ice sublimates at 6.1 millibars, about the pressure of Mar's atmosphere today, but in earlier times the pressure was probably higher. A river on Mars would have had a short-lived flow, and Ares Vallis probably flowed less than a year. The Pathfinder (Mars Environmental Survey) probe landed at the mouth of Ares Vallis on July 4, 1997 and deployed the rover "Sojourner" from the stationary lander. This probe took good color photos and measured compositions of rocks and soils, the nearby "Twin Peaks", and rolling dunes, etc. Rocks were tumbled up against each other suggesting flood effects. This chapter addresses why underground ice melted. Aram Chaos was a crater filled with fractured sediments in which the ice melted, but the explanation remains a mystery. Water exited Aram in a great gorge, one of the wonders of the planet and leading to Ares Vallis to the east. Aram has hematite deposits. This is a major outflow channel with evidence of multiple episodes of flows at differing times, including a beautifully imaged small arroyo 200 meters wide winding through the larger channel. The banks of this channel reveal stratified erosion-resistant layers. Some water flows on Mars may have been underneath a thick ice pack. The differing flows raise the question whether Mars climate changed or fluctuated, perhaps due to some combination of volcanic eruptions, varying internal volcanic heat flows, and changing axial tilt (i.e., deviations from the current 25 degrees, probably extending from 13 to 40 degrees or higher over periods of 10 to 20 million years). This area exhibits more impressive images of channels, including the valley building process of groundwater sapping. Channels often contain accumulated sand dunes formed from sand that cannot escape. This chapter discusses putative Martian meteorites such as fell at El-Nakhla Egypt. This meterorite was much younger than usual asteroids, only 1.3 MY old (using dating with potassium/argon, uranium/lead, rubidium/strontium, or other radioisotopic techniques), and the contained gases that matched the Martian atmospheric composition. The time of flight in space can be estimated by changes caused by cosmic rays (presumably to crystal structure). About 20 meteorites have been found that are candidates for Martian origin, many on the ice of Antarctica. The oldest, ALH 84001 from Antarctica, is estimated to be 4.5 billion years old. The suggestion that possible fossil microbes were present in this specimen, based on microscopic appearance and the presence of magnetite, remains an unresolved question (though I am dubious). The younger nakhlites were blasted from Mars 11 million years ago. Some basaltic lava rocks from Mars crystallized 170 million years ago, confirming to the author the presence of active volcanism as recent as that. Some of the Martian meteorites were salty, suggesting that they had been salt-water exposed, perhaps to seawater. So far there are no Martian meteorites from middle Martian history (1300 to 4500 MY ago). The reason may be that those surfaces are mostly sand, dust, and weakly consolidated materials that don't launch into space well. This begins the chapters on the Amazonian era, the name deriving from the features of the Amazonis Planitia. The Elysium Planitia features the shield volcano Elysium Mons, rising 9 km above the surrounding plain, and older than Olympus Mons. Both planitias feature young-appearing lava flows and sparse cratering. The search for recent lava flows is continuing. A sidebar discusses the highly approximate results of dating using cratering. The lava flow from Elysium Mons is estimated by crater counts at 600-2000 million years old. Other sites show fresher lava flows probably no older than 10 million years or less. Contemporary eruptions have not been seen, but could occur. The region in the western hemisphere is dominated by a vast volcanic highland desert called Tharsis Planitia. It is a huge, gently swelling dome of lavas rising 9 km above the mean elevation of Mars and surrounded by radial fractures. Valles Marineris is a major canyon extending from it. The great volcanic cones on it are Amazonian. The region presumably overlies a mantle plume. The surrounding crust or lithosphere sags from the weight of the piled up lavas. The author discusses the question, did Tharsis affect the climate of Mars? This large dome affects the spin of Mars and thus may have contributed to climate change. This is the highest mountain on Mars and the largest volcano in the solar system. It was originally seen as a bright patch and called Nix Olympica. It is often surrounded by orographic clouds and has a central caldera 70 km across and 3 km deep. The slopes are made of young lava flows, some less than 10 million years old (thus it is probably dormant, not extinct). It rises 21 km above the mean reference Martian altitude (thus three times as high as Mt. Everest), 18 km above the immediately surrounding plain, and with a width that would span the Himalayas. Nearby are almost equally impressive Arsia Mons, Pavoina Mons, and Ascraeus Mons (17.8 km, 14.1 km, and 18.2 km in height). Another lower nearby volcano is Alba Patera. Spectacular views from MGS are included. This is the grandest Martian canyon of all, a prominent and complex feature effectively draining some of the Tharsis region. It probably began as a narrow fracture but was widened by water flows. Its floor is as much as 5.7 km below the mean surface level of Mars, and its walls rise up to 4 km above the floor. This exhibits a series of parallel fractures or fissures near Elysium Mons which cut through the lavas and are of recent vintage, probably still active, possibly reflecting tectonic forces similar in origin as Valles Marineris radiating from Tharsis. Some fissures appear to have given rise to dark flows of mud or lava. A large outflow channel system eroding through recent lava flows. Some of the flow regions exhibit streamlined islands around which water has flowed. The age is dated as recently as 2 to 10 MY ago. The source of the water is unknown. A chaotic terrain where uplands have been carved into blocks by fracturing and erosion. The author discusses the spurious Face on Mars, and the role of the media in fanning this frenzy--the face proved merely to be a highly eroded mesa. A region of melted mountains, debris aprons suggesting recent flow or creep of underground ice, similar to rock glaciers on Earth. Some of these flows may be less than 10 MY old. The discovery of hundreds of fresh-looking water-erosion gullies on Martian hillsides provided more evidence of recent water activity on Mars--the author compares their appearance to similar structures found in Iceland. They were more likely to form facing the poles, perhaps indicating they were originating from aquifers rather than from solar heating. Or their formation might be related to varying Martian axial tilt. Concentric and radial fractures in an impact crater superficially resembling evidence of a civilization. Large impacts give rise to many secondary impact craters, exemplified by the cluster of several dozen craters near the Ma'adim Vallis river channel system. Alternatively, some clusters might have resulted from the breakup of an icy comet prior to impact, or of ejected fractured rocks returning to the surface. Fascinating images of dust devils and the sinuous tracks they leave. Dust storms may pose a serious hazard to future astronauts. An impressive set of sand dunes; the process (saltation) whereby sand travels in a hopping motion; the transport of massive amounts of sand and dust by wind. The polar caps both probably have a central core of permanent water ice and a small amount of carbon dioxide frost seasonally deposited in the winter. Winter clouds form over the poles, which the MGS confirmed to contain carbon dioxide. The southern cap stays cooler and retains a carbon dioxide component year-round, possibly related to dust blocking sunlight. Dust can collect at the poles. The polar ice fields can exhibit strange surface formations. The polar ice may flow slowly outward over nearby terrain. Although the polar regions can be quite cold, the summer pole is a land of midnight sun, more tolerable in temperature, and could yield water that might make feasible future manned missions at least in the summertime worth considering. Is there alien life in the solar system or the universe? Has it ever existed on Mars? Early conditions might well have been conducive to the presence of life. Review of the chemistry of life, and experiments that simulated conditions that could lead to the formation of chemicals that would be needed as building blocks. Mars versus the fundamentalist Creationists--the potential impact of finding life on Mars. Could dormant life forms such as bacteria be found underground or below the ice on Mars (like in Antarctica's Lake Vostok)?